Lock in a great rate and save with confidence. 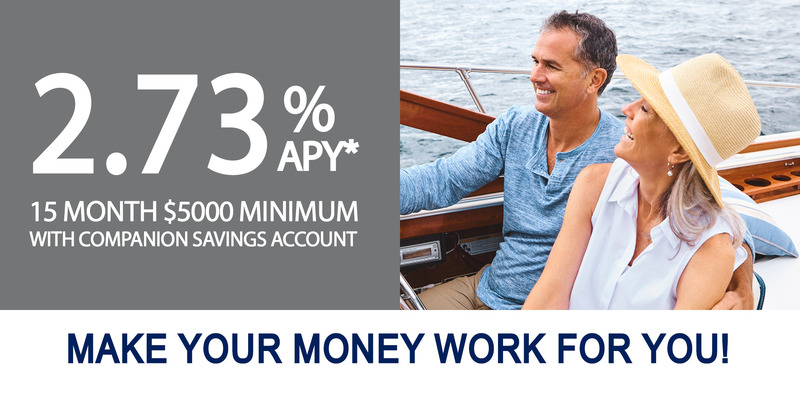 Maximize your short term savings return by taking advantage of our current promotional 15 month CD (certificate of deposit) rate of 2.73% APY. * Minimum deposit is $5,000. In order to qualify for this great rate, you must open a Companion Savings Account at the time of opening the 15 month CD special. Our Companion Savings Accounts are a great way to get high yields combined with total liquidity! Learn more about our Companion Savings Accounts here. Don’t miss your chance to get this great rate! Visit your local First Bank Kansas branch or call 785.825.2211 to learn more. Click below to find a First Bank Kansas location near you. *Annual Percentage Yield (APY) is effective as of April 8, 2019 and is based on quarterly compounding. A minimum deposit of $5000 is required. CD will renew at the standard rate and terms offered by First Bank Kansas. Available for personal accounts only. Substantial interest penalty for early withdrawal. Offer may be withdrawn without notice. Must open Companion Savings Account at the same time as CD. See First Bank Kansas for details. Member FDIC.